Bruce Lee's death has caused controversy over the years, as the circumstances surrounding it have struck many as just a little too unclear. Wikimedia CommonsBruce Lee’s death has caused much controversy over the years. When Bruce Lee awoke on the morning of July 20, 1973, he was an active, healthy 32 year old. He spent the day meeting with producers about his next film, then headed to a friend’s house for an afternoon visit. By nightfall, the greatest martial artist in a generation lay dead on a mattress on the floor, and the world was left to wonder: how did Bruce Lee die? The culprit was just one thing Lee did that summer day — a small decision with consequences no one could have anticipated. 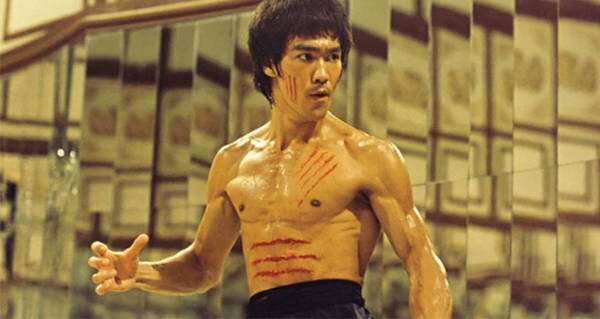 The trouble started two months earlier, when Lee collapsed on May 10 during an automated dialogue replacement session for his movie Enter the Dragon. He was rushed to the hospital, where he complained of a severe headache and was wracked by seizures. Doctors recognized the symptoms of cerebral edema, a condition in which excess fluid in the brain causes swelling and pain, and were able to treat him immediately with mannitol. After a brief hospital stay, he felt much better — this wasn’t, he told his friends, how Bruce Lee would die. Wikimedia CommonsBruce Lee in 1967. On his release, he promptly resumed his usual fitness regime and continued eating his usual diet: a strictly enforced combination of vegetables, rice, fish, and milk that excluded all baked goods, refined flour, and most refined sugars. Until July 20, he seemed to be recovering extremely well from his cerebral edema and, aside from complaining of an occasional headache, gave his friends no reason to worry. The day of Bruce Lee’s death was a busy one. He was in Hong Kong, where many of his movies were made, and had been meeting with producer Raymond Chow for most of the day discussing his upcoming movie. He was reportedly filled with enthusiasm, acting out scene after scene with energy despite the scorching summer heat. After the meeting, Bruce went to the apartment of a friend — or, as some would later clarify, his mistress, Taiwanese actress Betty Ting Pei. They were alone for several hours, then made dinner plans with Lee’s producer to finalize his movie deal. Around 7:30 in the evening, shortly before they were due to depart, Lee complained of a headache. Ting Pei gave Lee an Equagesic, a common painkiller containing aspirin and a tranquilizer known as meprobamate. After taking it, he went to lie down. After a few hours, when Lee didn’t come down for dinner, Ting Pei went up to check on him and found him unresponsive. She called Chow back to the home, and he attempted to wake Lee without success. They were forced to call a doctor, who spent ten more minutes attempting to revive Lee. Unable to recall the martial artist to consciousness, they sent him to a nearby hospital in an ambulance. By the time the ambulance arrived at the hospital, Lee was dead. A Shocked World Wonders: How Did Bruce Lee Die? 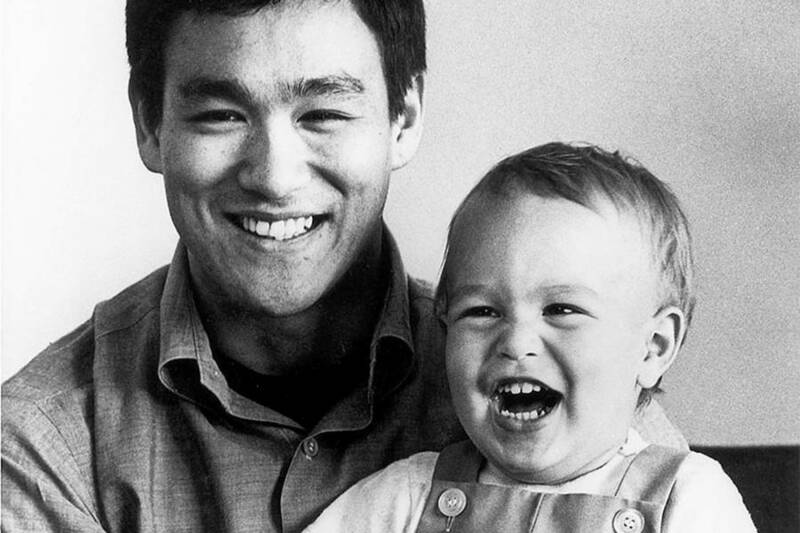 Wikimedia CommonsBruce Lee and his son Brandon Lee. Because Lee’s body showed no external signs of injury, an autopsy was performed, revealing that Bruce Lee’s death was the result of severe brain swelling: a buildup of fluid had resulted in a 13 percent increase in brain size. 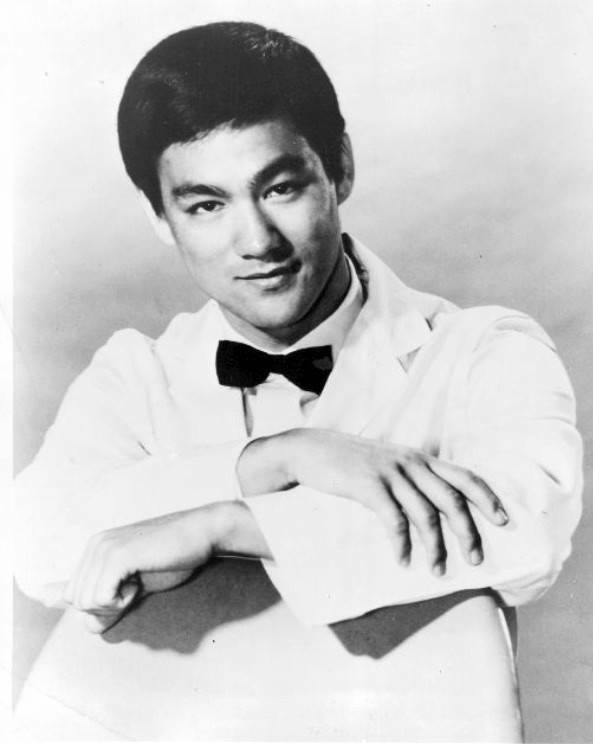 Chow claimed that Bruce Lee’s death was the result of an allergic reaction to the painkiller he had been given, and the autopsy report seemed to partially substantiate his claim. The coroner officially ruled Bruce Lee’s death the result of a second cerebral edema brought on by taking Equagesic. He called Lee’s end “death by misadventure,” which, unlike death by accident, implies that death occurred due to a dangerous, voluntary risk — though Equagesic was not generally considered dangerous to take. Though several subsequent investigations backed up the coroner’s report, that didn’t stop a flood of conspiracy theories. As with other Hollywood stars who also died of drug complications at young ages, including Elvis Presley and Marilyn Monroe, it seemed to the public that the coroner’s report just wasn’t good enough. 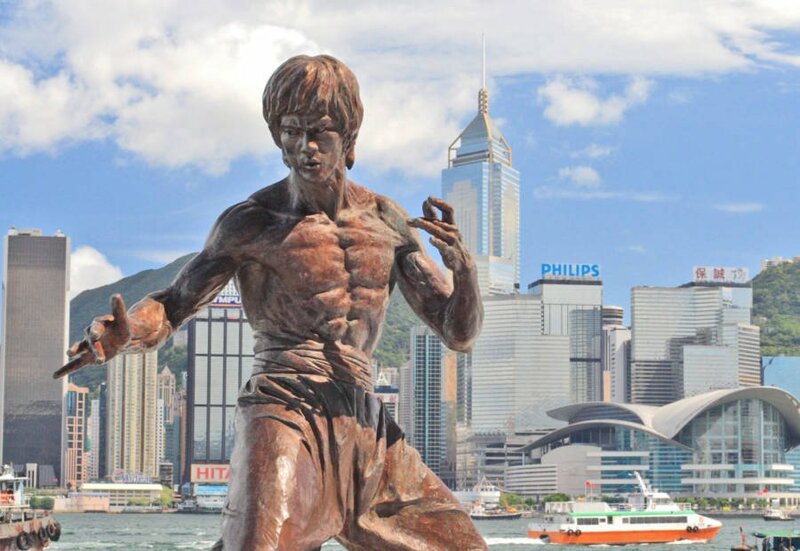 Wikimedia CommonsThe famous Bruce Lee statue in Hong Kong. Lee’s friend Chuck Norris claimed that there had been an interaction with muscle relaxants that Lee was taking, and that was how Bruce Lee died. Norris’s words sparked a debate about what else Lee was taking: Stimulants to keep him in shape? Herbal supplements to keep him healthy? 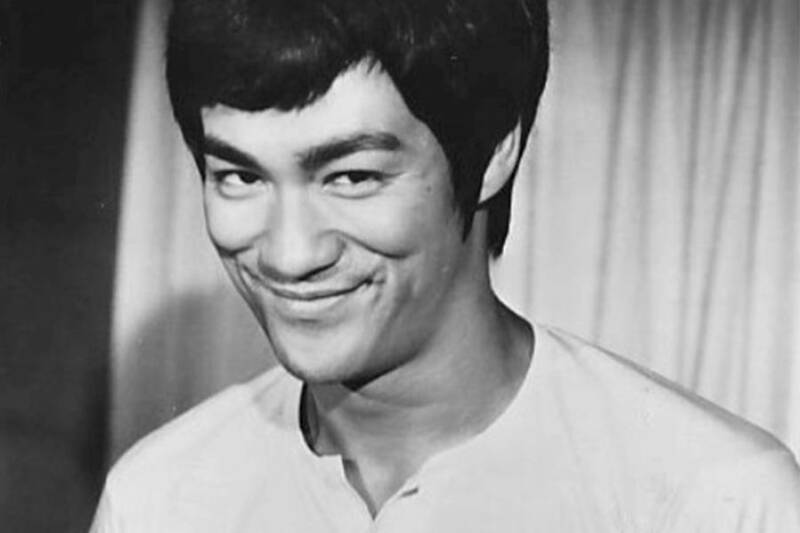 There was also a rumor that Bruce Lee’s death was caused by a prostitute with whom he had gotten violent. The rumor claimed that Lee was under the influence of a powerful aphrodisiac that caused him to lose control. The prostitute then killed him in self-defense. Some fans of Lee’s who had heard that the fatal dose of Equagesic was administered by Betty Ting Pei claimed that she had poisoned him on purpose and that she had been working for a secret society that wanted Bruce Lee dead. No immediate answers as to why a secret society would want Bruce Lee dead presented themselves. Other theories blame everyone from the Mafia (Italian, Chinese, and American) to his fans to even his family. But the theory that continues to hold the most sway among Lee’s admirers is the story of the Lee family curse. 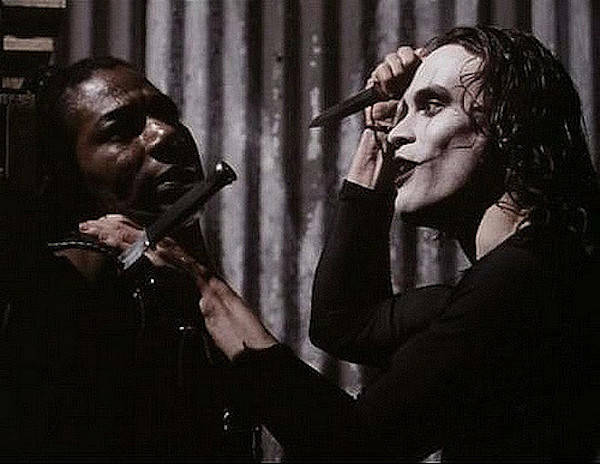 FlickrA white-faced Brandon Lee plays Eric Draven in cult classic The Crow. The legend of the Lee family curse came to light 20 years after the famous martial artist’s death, when Bruce Lee’s only son, Brandon Lee, was following in his father’s footsteps as both an actor and martial artist. In 1992, Brandon Lee was a star on the rise — the 28 year old had just landed the biggest role of his career. He was playing Eric Draven in The Crow, a comic-book-turned-movie about a murdered rock musician who returns from the dead to avenge his and his fiancée’s murders in a dark, Gotham-esque landscape. The tortured story would make his career — but he wouldn’t be alive to read the reviews. In a freak accident, Lee was shot on set during filming when a prop gun that wasn’t meant to be loaded fired a live round into his abdomen. As with his father, rumors of a conspiracy swirled even after officials ruled his death an accident, and the untimely end of a second young Lee led to the story of a Lee family curse. 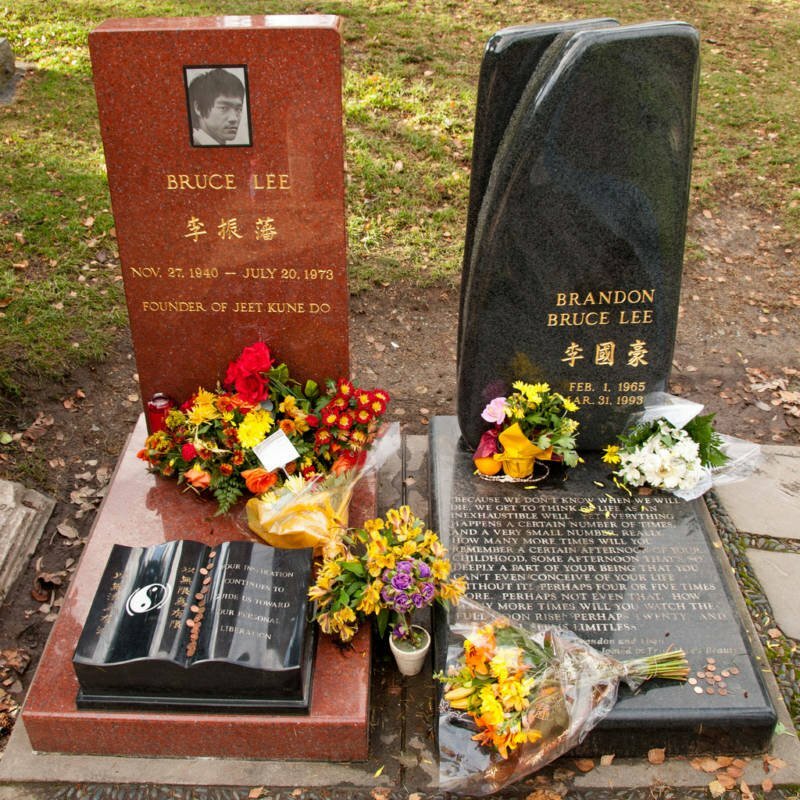 Tony Fischer / FlickrThe graves of Bruce and Brandon Lee in Seattle’s Lake View Cemetery. Someone dug up the information that Bruce Lee’s older brother had also died under mysterious circumstances before Bruce Lee was born — and with that, rumor became full-fledged mystery. How did Bruce Lee die? In the end, the simplest explanation seems the most likely. But perhaps Lee, ebullient and dramatic, wouldn’t mind a little mystery around his last hours, a fitting end for the legend who inspired so many to join the fight. After learning about Bruce Lee’s death, read these 40 Bruce Lee quotes that will change your life. Then, check out the strange death of Edgar Allan Poe.